Cab and steak. That’s the pairing that most often comes to mind when thinking of food pairings with Cabernet. And for good reason – it’s a great match. 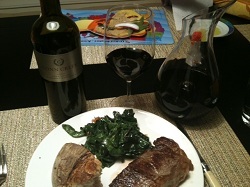 A slab of steak with the Conn Creek Cabernet. And yes, that’s my child’s Tigger plate in the background. What makes Cab and steak go so well together? It’s all about the food components matching the wine components… In basic terms: Fat + protein breakdown tannins in wine. And what does steak have? Fat and protein. Cabernet? Plenty of tannins there. Tannins are a hard component, fat is a soft component. They, in turn, balance each other out. Tannins cut through the fat in the steak, bring out the juiciness in the meat, while the fat and protein in the steak tame the tannins, bringing out the fruit in the wine. It’s one of those pairings where 1+1=3. There are plenty of other great Cabernet Sauvignon pairings out there. And since many Cabernet Sauvignons differ in the level and style of tannins, a variety of foods can pair well. To be entered for a chance to win a $50 gift card from Wine.com, tell us your favorite pairing with Cabernet and WHY!